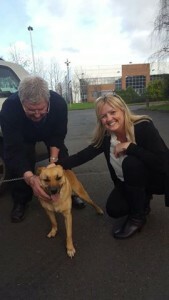 Finding Goldie: The story of a much-loved family dog that went missing from Finglas in July 2016 came to a happy ending when Goldie, a golden cross-breed dog, was rescued on the grounds of Tallaght Hospital with the help of the Animal Trust Fund in 2017. 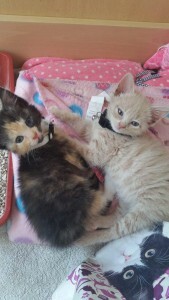 Kittens: These two gorgeous kittens were found in a very bad way, extremely skinny and suffering from very bad flu. Their eyes were badly infected and they would have died for sure if not taken in by an ATF volunteer. After a trip to the vets and many weeks of foster care and treatment they made a full recovery and found a fabulous home together. 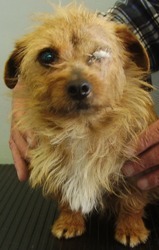 Maggie was brought to a vet clinic on the south side of Dublin with an horrific injury to her eye which sadly resulted in it being removed as it was beyond saving. She also had a burn on her back which was an old injury and it had healed by itself. Sadly her owners never came back for her and the ATF paid for her surgery with the donations received by our supporters. The nurses and vets took great care of her, and her wound healed very well. Maggie was skinny, very quiet and extremely withdrawn when she first arrived to the vet clinic as she was in a lot of pain and had little appetite but as she healed from her surgery and received pain relief she started to come to life and respond to the vets and nurses with licks and tail wags as they daily changed her dressings and they discovered she was a real sweetie and was soon really enjoying her grub. 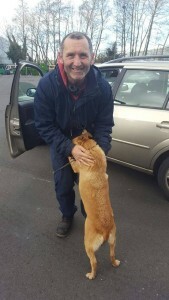 After some time she was placed for re homing but one of our members who was fostering her fell madly in love with her and couldn’t part with her as she is such a special little dog who despite being mistreated in the past has a lovely sweet nature. Lady & Tramp – In 2006, two dogs were abandoned on the grounds of Tallaght Hospital. They were both in bad shape, skinny and suffering from skin problems. They were both terrified of people and no one could get anywhere near them. 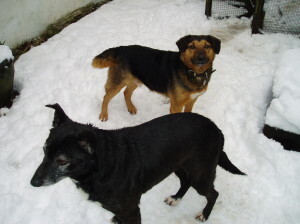 The staff began to notice these dogs roaming around in the early mornings when they arrived to work and the night staff witnessed them too but no one no matter how much they tried could manage to get close to them in order to catch them to help them. Some staff members kindly fed them every day and they were fed very well but their concern grew for them as it was very cold out and they obviously needed to be seen by a vet. Despite ringing a few other charities no one responded or were unable to help and the staff were at a loss as to what to do. They tried very hard to earn the stray’s trust but their fear was too deep. Eventually after many weeks the ATF were alerted to the situation and our most experienced member who has been rescuing animals for over 50 years managed to catch the two dogs in a humane trap. The staff were thrilled and greatly relieved. They were brought straight to the vets in Tallaght were they both received full health checks and treatment for their skin. They were later named Lady and Tramp. Once they were caught they were very quiet and nervous but both had gentle and sweet temperaments and allowed the vet to examine them as if they knew they were now safe and we were trying to help. They both looked like they had had very hard lives so far. They were badly scarred, in poor health and poor lady looked like she had many litters of pups in her life. The vet estimated they were both well on in their years between 8 and ten years old maybe. We were determined not to split them up and they both went to a fabulous home together surrounded by fields and a forest were they happily both lived out their days well fed and loved. We were very grateful to the staff of Tallaght Hospital for taking care of Lady and Tramp until they were rescued and big thank you for the donation they made towards their vet bills. 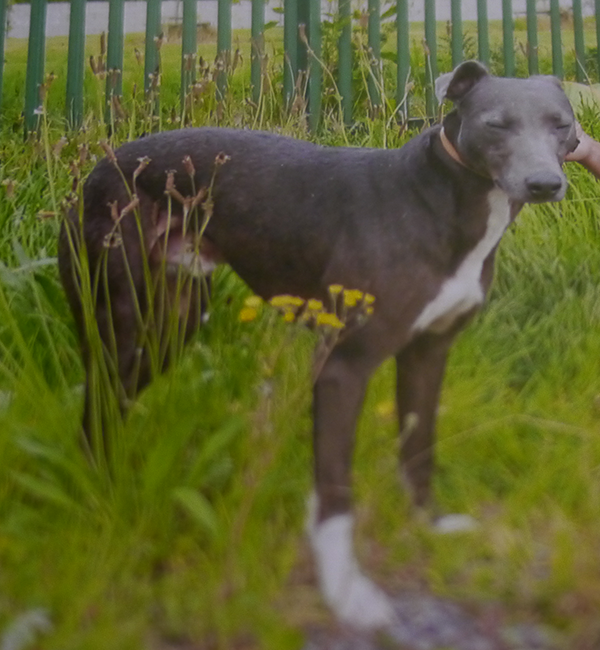 Taylor was found in Phibsboro in a bad way. 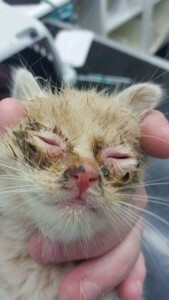 He had an horrific injury to his tail and was extremely skinny and dirty. His tail had to be removed which he recovered well from while in foster care, and he slowly gained weight. We searched for his owners as he was neutered and tame so we knew he belonged to someone at one time but for whatever reason he had ended up straying, hungry and injured on the streets. 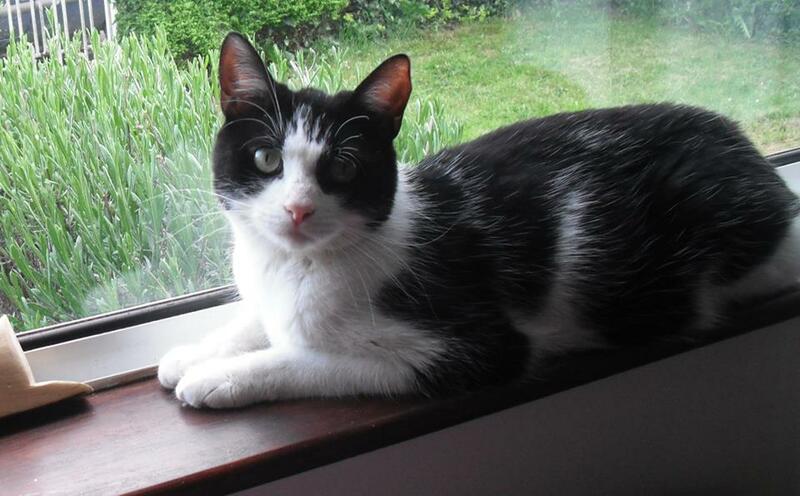 He was very shy and wary of people at first but he came round with lots of TLC from his foster mum. He spent 9 months in foster care before he found a loving home of his very own. 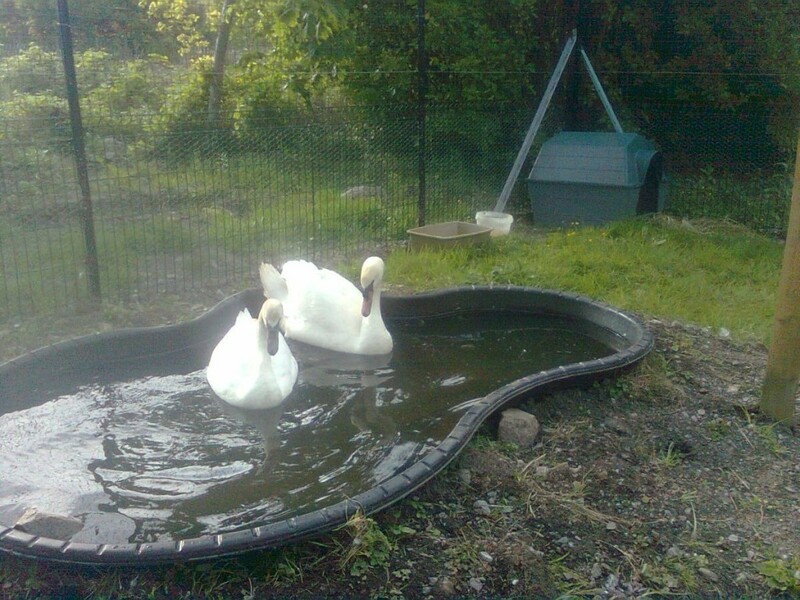 Daz the swan, was deliberately injured by a crossbow. His lengthy recovery took place in the care of the ATF. Mucky was living wild and extremely timid. The ATF eventually managed to catch him and he was successfully re-homed. Yoyo was dumped in a recycle bin along with his brother buttons, they were extremely nervous and untrusting. The ATF spent a month caring for them and gaining their trust until they eventually found new homes. 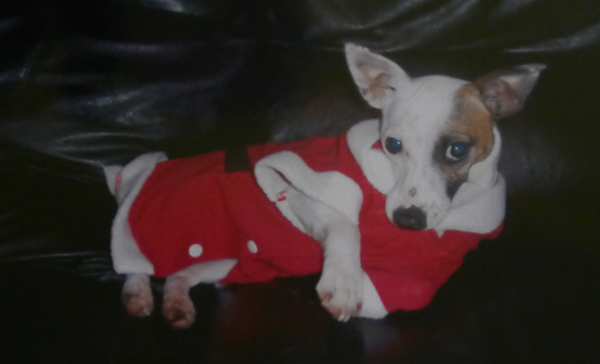 The ATF receive a picture of YoYo every Christmas from his new owners. 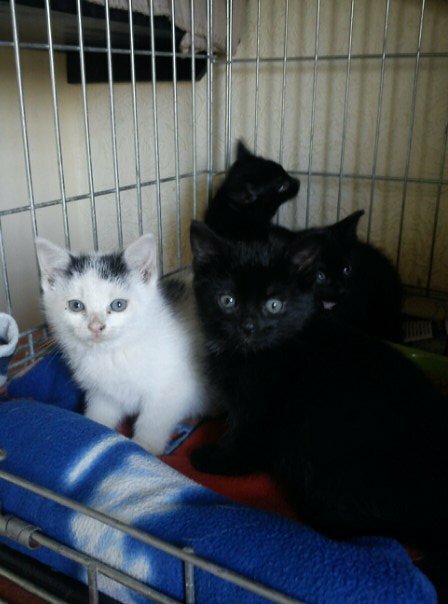 This litter of kittens was rescued from a nursing home car park in Ballymun. They were born in the bushes and were at risk of being run over as they played in between the cars. 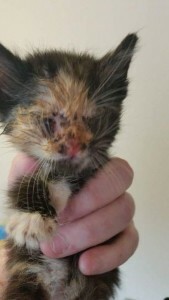 The kittens were successfully tamed and homed by an ATF volunteer, and their mum a feral cat, was trapped, spayed and returned to live out her life on the grounds of the nursing home where the staff fed her well. 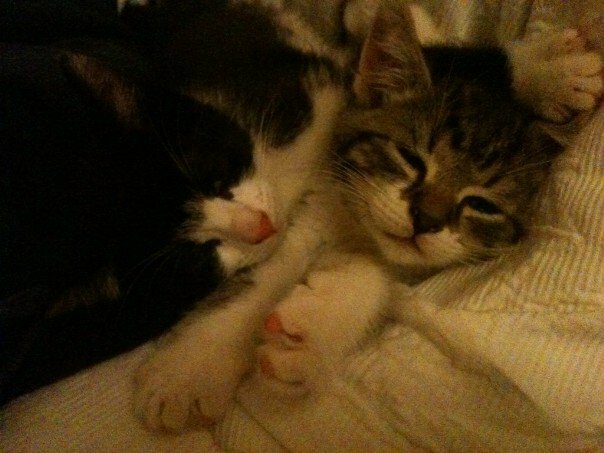 Colin & Fred were born in a garden in Ringsend and were rescued as tiny kittens. They were strongly unwanted by the people who lived in the house. Their mum was trapped and spayed but placed into another colony in a safer location where she still lives today. This pic of Colin & Fred was sent to us from their new owners who love them dearly.